As one of the premier Cape Cod beach hotels, Seadar Inn by the Sea offers guests a quintessential Cape Cod vacation. With beautiful Bank Street Beach just 100 yards from Seadar Inn, and the charming village of Harwich Port within easy walking distance, you can choose to park your car for the weekend – or for an entire week – and never run out of things to do. From trampolines and trips to Nantucket, and from hiking, biking and golfing to charter fishing for bluefish, striped bass and Bluefin tuna, Harwich Port is Cape Cod at its best. 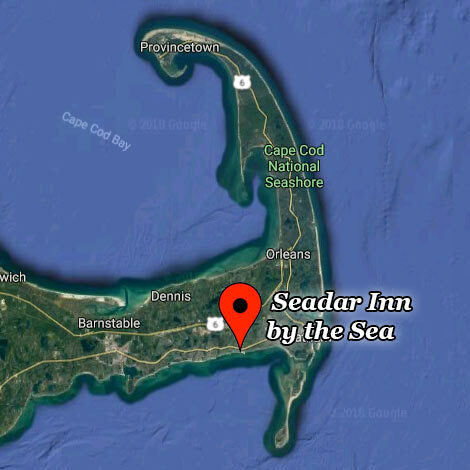 With our central location, you’ll find Seadar Inn is the perfect place to call home as you explore all of the activities Cape Cod has to offer. Both Hyannis and Provincetown are just a short drive from the inn. Head out to Provincetown for a whale watch and a day of shopping and dining. Or hit the links at one of the public golf courses located within a half hour of Seadar Inn. There are nearly a dozen! Seadar Inn by the Sea pairs vintage ambiance with every modern convenience. It’s the kind of place where white wicker meets Wi-Fi; where quiet days spent on the beach with a book provide a restful prelude to an evening of wining and dining. At Bank Street Beach you’ll find a wide, white sand beach on the warm waters of Nantucket Sound where there’s plenty of room to spread out your towel and claim your spot for the day. Parents will appreciate the watchful eyes of seasonal lifeguards and gentle surf. Kids will enjoy making new friends and regular visits from the ice cream truck! Those seeking sun, sand and solitude can walk down the beach just a bit for more privacy. After your day at the beach, walk to the village where you’ll find an array of restaurants. Savor a platter of oysters on the half shell and fresh swordfish at The Port. Tuck into fried clams and a local brew at the Land Ho! or visit the fun and funky Ember for wood-fired pizzas and a creative take on wings. Just be sure and save room for dessert because you won’t want to miss homemade ice cream at Sundae School. Pop into the shops and galleries on Main Street in Harwich Port before enjoying a leisurely walk back to your home away from home at our beach hotel on Cape Cod. The Seadar Inn by the Sea is located at Bank Street Beach on the warm waters of Nantucket Sound where the ocean temperatures average 72 degrees all summer. Enjoy a great Cape Cod Vacation at one of the best Cape Cod hotels on the beach! !